Pie Crazy: Could You Make a Pie a Day? They say an apple a day will keep the doctor away. What would a pie do for you? A local chef and radio host is hoping it will generate enough interest that you will join her Labor Day weekend in a celebration of pure pie madness. Evan Kleiman is host of "Good Food, " a weekly radio show on KCRW, and the owner of Angeli Caffe in Los Angeles. Last summer, she decided to make a pie a day. This year, Evan is joined by guest chefs, cookbook authors and food bloggers in her daily pie project. It is all in the name of generating a shared love for pie and to encourage her listeners to enter a Labor Day weekend pie contest. 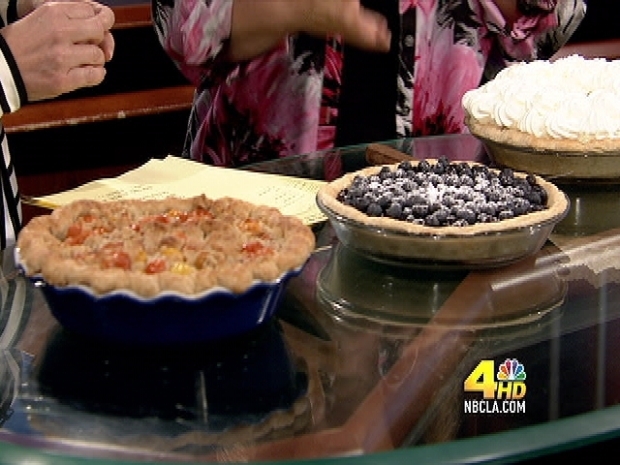 On NBCLA she showcased three pies: a delicious blueberry pie, a cherry tomato pie and a coconut, chocolate creme pie. If you click on each name you'll find the individual recipes. If you think your pie can beat out other pie bakers, then you may want to join Kleiman for the Labor Day Pie Contest. The deadline to enter is August 30th. You can enter by going to theKCRW website. Talking pies with Evan Kleiman. The contest is Sunday, Sept. 5 at the Taste of Beverly Hills. There is no fee to enter the contest.